Meet the bigger, better, and bolder Drobo 8D. Capable of supporting 16 volumes of up to 128TB, with a total storage pool of 256TB, 8D is designed to meet the need for data-intensive workflows. With lightning speed ThunderboltTM 3, the Drobo 8D is the fastest direct attached Drobo yet. The 8D comes equipped with a Drobo Accelerator Bay, and is the only Drobo with the new Intelligent Volume Management technology. Built on award-winning BeyondRAID™ technology, Drobo 8D simply protects your data against a single or dual disk drive failure. Most storage arrays use either all hard drives or all SSDs. The Drobo 8D delivers the best of both worlds by intelligently combining hard drives and SSDs to deliver both capacity and performance. 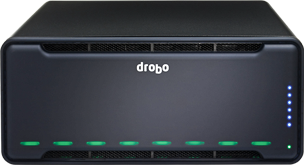 The Drobo 8D gives you the option to enable Hot Data Caching through the Drobo Accelerator Bay on the rear slot. Using an SSD allows access to most frequently read data to deliver blazing fast speeds. This boosts performance of popular applications such as Apple’s Final Cut and Adobe Lightroom. SSDs can also be utilized in the front bays of the Drobo 8D for Data-Aware Tiering, allowing for transactional data to migrate to the SSDs. This ensures that both writes and reads are accelerated. New to the Drobo product line is the Intelligent Volume Management technology available on the 8D. This technology combines the flexibility of manual volume configuration with the convenience of Drobo’s legendary automation, allowing for separation of file systems as customer needs dictate. The 8D allows the creation of up to 16 volumes with a maximum 128TB volume size, and a 256TB storage pool. Drobo 8D storage array offers a lightning fast ThunderboltTM 3 connection (macOS only) that is both fast and backwards compatible. This optimizes your performance when transferring large volumes of data. With the dual ports, the Drobo 8D connects up to six Thunderbolt devices or five devices and a monitor at the end of the chain. Supports one 5K or two 4K displays (with a Thunderbolt dock). 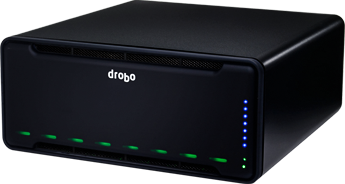 In addition to drive failure protection, Drobo also protects against potential data loss during a power outage. 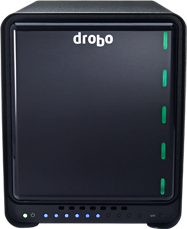 In every Drobo we include battery backup technology to protect data in memory or cache. When power spontaneously goes away, Drobo moves any in-flight data to onboard flash in your Drobo, so it will be protected and moved to your disk drives once power is restored. This ensures your important information is safe and sound. Even better, your battery recharges itself and is designed to last for the life of your Drobo. DroboCare extends beyond Standard Hardware Warranty, providing you with additional peace of mind. 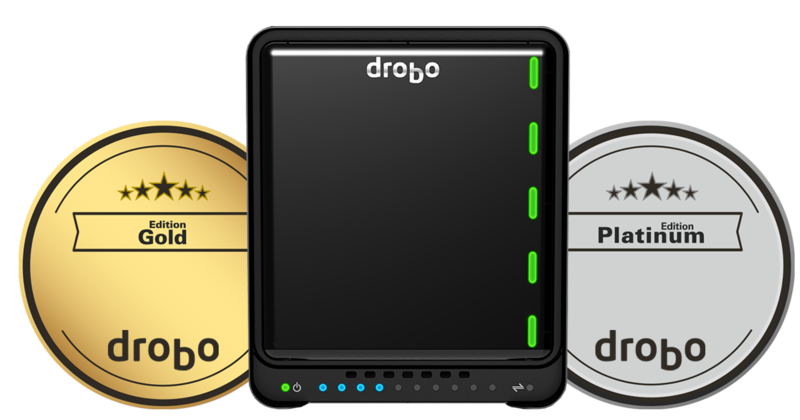 If an issue occurs, we will immediately send you a replacement Drobo and pay for shipping both ways. Phone support is also available 24×7, beginning the day you activate DroboCare.